The best product I have EVER purchased - INCREDIBLE! I am 22 and have suffered with acne for the last couple of years, the red and painful type! I went for a facial at an ESPA spa and the masseuse recommended that I buy this product due to my skin being dehydrated along with the Optimal Skin ProMoisturiser. I absolutely did not expect to wake up a couple of days later (3 days MAX) with clear, pain-free, hydrated skin! My skin hasn't looked or felt this good in so long and I feel so much more confident. I 1000% recommend to anyone who struggles with acne or dehydrated skin. I am going to stock up on this along with the moisturiser just in case either of them ever stops selling!! Absolutely worth the money, can not hype it up enough! 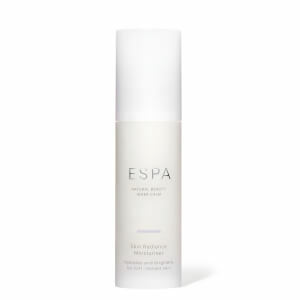 Having suffered with psoriasis on my face for years, I no longer have to worry since discovering espa optimal skin procleanser. It keeps my skin hydrated and soft, hiding my dreadful scaly patches. LOVE IT! Even though I'm in my early 30s I still get troubled by big angry red spots. After using this cleanser along with a mild glycolic acid from another brand AM and PM then the ESPA Optimal Moisturiser I have noticed a massive difference in my skin. Whereas before I felt I needed to cover up my skin with makeup to mask the spots, I now feel comfortable to go out make up free as my skin has improved that much. Big fan of the optimal serum too even though i'm not currently using it in my routine (for fear of changing anything and the spots returning!). I do have issues with my skin being red blotchy and rough on the surface – not helped by the fact I put extra makeup on to cover all of these blemishes. However after using this product and the full optimal range my skin felt clean, soft and healthy. Meaning I don't need to wear as much makeup if any some days! PERFECT COLLECTION for troubled skin! I love this product so much because my skin feels so clean and soft after using it. It smells amazing so the experience is very relaxing and enjoyable. I tried travel size versions of the cleanser toner and moisturiser and loved how they made my skin feel so treated myself to the full size versions. 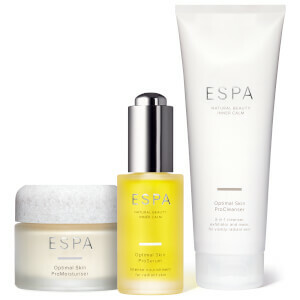 My skin feels amazing now I’m an ESPA convert! The cleanser is the best i have used, other high end cleansers didn't leave any special results where as i feel fresh every night and the smell is like a spa. It feels like i am using something more luxurious. I use it with other Espa products and they work like a dream. I love this - I use it a couple of times a week and my skin has never felt better! I use this together with my Pro Optimal moisturiser and serum. Love love love these products. The best cleanser I have ever tried - leaves skin soft rather than tight. Also eco-friendly as micro-beads dissolve.